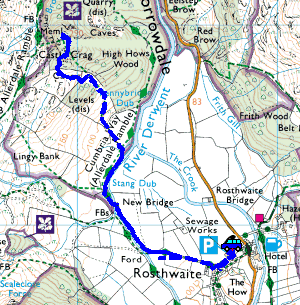 A new years day walk up to Castle Crag in Borrowdale. Following the path to Castle Crag. Rosthwaite and the wonderful Borrowdale. Skiddaw and Derwent Water from Castle Crag summit. Walla Crag in the shade and Blencathra in the sun. The view to Derwent Water from Castle Crag. Eagle Crag getting some sunshine too.